A while back, some friends asked me to take some photos of them for a contest in BUST magazine. They didn’t win, but did make it on the honorable mention page. Congrats Cameron & Rachel! The beard is back. I don’t know how long it’ll last, but it started on my bike trip to Portland, and so far, I like it. I went out last night to watch the eclipse, and came home at 3 AM with some photos. My dad’s upcoming 40th college reunion prompted us to work on finishing up the light machine. Look for pictures (and maybe video?) soon. Well, it is free, I suppose. I spent the weekend up in Burlington at Spawnfest. Shadrach did alright – we won our easy games handily, but couldn’t quite squeak out wins against two tough teams, and we came in third. 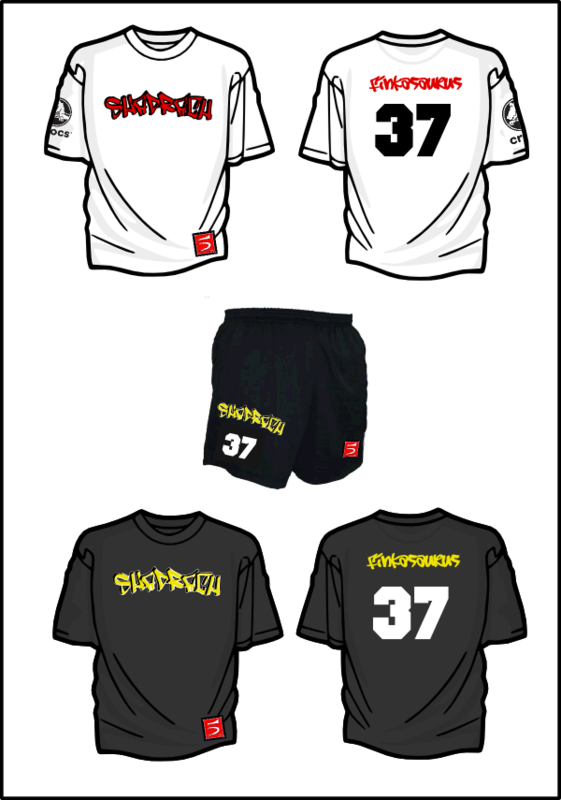 We did so in style, though, as we got our new jerseys and shorts from Five Ultimate. Thanks to them and Crocs for the gear & support! Sunday night I got back from my Portland trip, content, but legs like jello. I’m planning on writing up my thoughts, but the preview is: I had a great time biking down, hanging out, and playing frisbee, but if I did it again, I’d leave more time to recover before playing at a competitive ultimate tournament. Shadrach did pretty well at Kleinman. We won the games we were supposed to win, and did quite well against teams that we weren’t supposed to beat. We’ve got some work to do before Spawnfest and the Fall Club Series, but we’re on our way. The trip was a great ending to a month of fun. I certainly wasn’t expecting to get laid off, but think I did a fine job of taking advantage of free time in Seattle in the summer. Not that the fun is completely over, but it’s time to buckle down and start the job search. I’ll be updating my resume & portfolio in the coming week and pounding the pavement looking for leads. I’m hoping something comes out of this week’s Ignite, too.